It's really not that detailed, but I couldn't find many good patterns for a legitimate oval when I was making my Batman hat, so I made one up. Other than the Batman hat, I used these ovals to make a couple really quick and simple coasters inspired by probably my favorite video game Portal. Oh wow. Thank you so much for the bat and oval. I paid for a bat pattern that I just could not follow. So complicated. This came out GREAT! Thanks for this pattern. 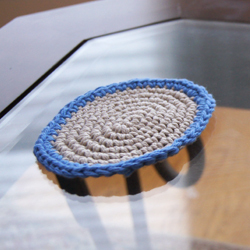 But how crochet round 9? The last words in this discription are confused me. My english ist not so good.